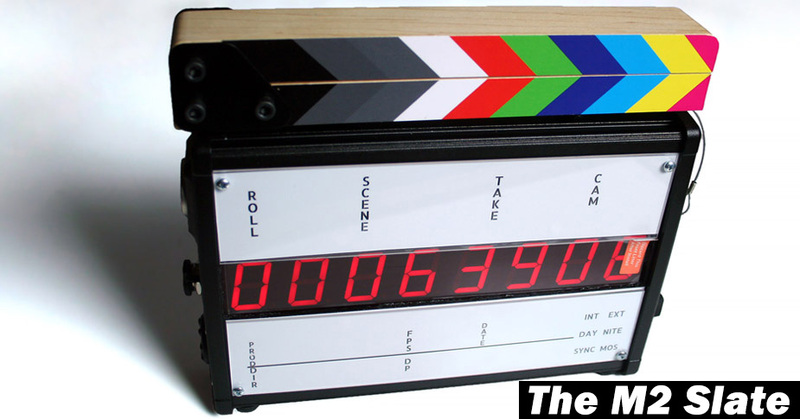 New Timecode Slate and Upgrade Path! After much delay we are glad to finally announce the M2 Timecode Slate is a new slate in the pipe replacing the FDC Compact Slate (FDC Display will continue to be built). The enclosure is made of aluminum and all ports are sealed making it water resistant (IP66), like the FDC you do not need to worry about using it in the rain and shallow waters without protection. This slate will definitely stand up to the abusive set life. Buttons on the back will not change any settings once the slate is running, one button will display the last slated time. We like options. Not everyone have the same requirments or workflows. The 5-Pin Lemo is standard on every slate, from there you can add BNC and 1/4" IN/OUT in various styles. You will also be able to special order several different color enclosures. Extra tabs are available through other distributors (Mouser and Digi-Key) that you can use to mount to the wall as an expensive wall clock! Additional options will add to the cost as well as build time. You can think of it as built to order. MRE to M2 Trade-in Upgrade! That's right, MRE slates can be upgraded to the new slate. This is a great for those just starting out to get an affordable slate and then upgrade to a much tougher slate down the line. Upgrades are expected to take between two to three weeks after the we receive the MRE slate from you. As an appriciation to those who have already purchased our slates we will be offering discounts. Slates MUST be in working condition to be traded-in, otherwise you will be charged for repairs prior to upgrade. Upgrade prices does not include shipping. Please email Support@FUZETi.com with your name and slate serial number to begin the upgrade process. Upgrade for $200, additional options remains at their regular prices (Availble until at the very least December 31st, 2017, will most likely be extended when the time comes). Current owners with back handle option can send it in with the slate to be resized for free. Beginning Jan 1st, 2018 price will increase to $300.00. MRE Slate purchases on or after 01/01/17 - $299.99 Trade-In (Available for as long as the M2 is shipping). Beginning Jan 1st, 2018 price will increase to $399.99. The final retail price will be $949.99USD and the FDC Compact slate will drop to $799.99 until our inventory runs out. There are some that found the lack of a power switch to be a deal breaker. You will now be able to add it as an option when purhcasing the slate, or current MRE slate owners may send it in to install for $10 + S/H. Please email Support@FUZETi.com to proceed with the mod. MRE and M2 side by side comparison. Recently someone managed to dig up an old slate built by Fisher Robotics on the JW forum (http://jwsoundgroup.net/index.php?/topic/28779-identify-this-slate/#comment-325017). It was a poorly runned business bordering on a scam before JW Forums was formed, https://groups.google.com/forum/#!topic/rec.arts.movies.production.sound/i-wFz1_yjD8. Because of this Fisher guy he created much hesitation among sound professionals that our slates would just become the same vaporware. After 3 years in business and going strong we believe we have overcome this hurdle. We truely appriciate those who took the risk and jumped on in with our slates. Thank you.